I received this video clip this week on Robert Earl Keen who, according to the description on his agent’s website, is a Texas singer-songwriter, career artist, brilliant storyteller, sardonic humorist, poet of the strange and familiar. 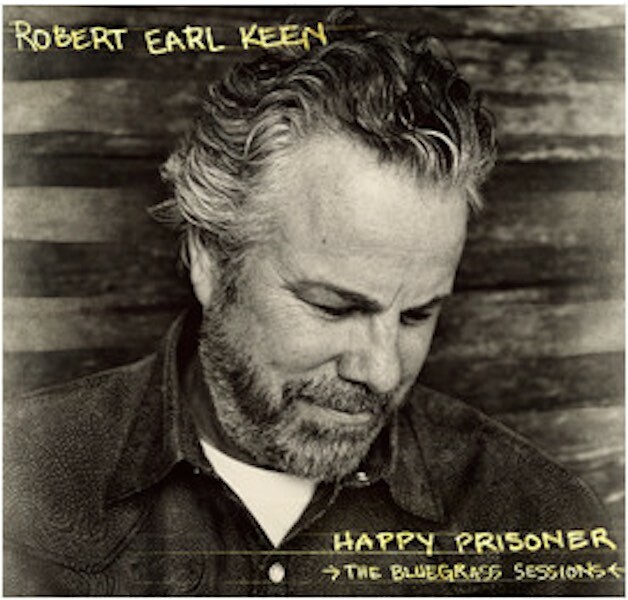 Keen has released a new album called Happy Prisoner, and thus comes the added description bluegrass artist and singer. I’ve had a lifelong love of bluegrass. I’ve always had an affinity for music that I felt like you’d listen to in your living room. Music that felt real. My mom liked the old hillbilly music, and as a kid, I used to fall asleep listening to an 8-track tape of Jimmie Rodgers’ greatest hits. When I was in 9th grade, one of my first dates was taking a girl to a bluegrass festival. That sounds crazy for someone in Texas. But I was fascinated with that music, even though it wasn’t part of the gulf coast at all. When I started playing, my first guitar hero was Norman Blake. In college, I had a bluegrass band called the Front Porch Boys, went to fiddle contests, learned a jillion fiddle and old-timey songs. My whole education in music started with bluegrass. That’s partly where the album title comes from. I’ve been listening to it forever, I love it, and so I feel like I’m something of a happy prisoner of bluegrass – Robert Earl Keen. As with his past two albums, Happy Prisoner was recorded at The Zone studio in Dripping Springs, TX, a town famous for Collings Guitars, Salt Lick Barbecue and Willie Nelson’s 4th of July picnic concerts. The record also finds Keen re-teaming with producer Lloyd Maines of whom Keen says “Lloyd brings so much to the table – incredible musicality, great patience and he’s one of the best people persons I’ve ever known. He has a way of bringing the best out of people. He’s like the grand father-head of the entire studio, he’s so kind and friendly and encouraging about everything, and he knows in his head what he can get people to do. Also on the album are Keen’s longtime ace band, consisting of guitarist Rich Brotherton, bassist Bill Whitbeck, drummer Tom Van Schaik and steel guitarist Marty Music, plus a star-studded cast of special guests, including Danny Barnes on banjo, Nickel Creek’s Sara Watkins on fiddle and Lyle Lovett and Natalie Maines on vocals.